Find a Rat Pack Tribute Act for hire near you in minutes! Option 1. Enter your event location below & contact a Rat Pack Tribute Act directly! Option 2. Request multiple quotes from available Rat Pack Tribute Acts Get Quotes! Option 3. Read information & advice on hiring Rat Pack Tribute Acts Read Advice! WANT TO KNOW MORE ABOUT RAT PACK TRIBUTE ACTS? Read on for the most comprehensive guide to booking a Rat Pack Tribute Act, including how much a Rat Pack Tribute Act costs, exactly what they will do at your event, plus tips, advice and information to help make your event one to remember! With a Rat Pack Tribute Act, you will get a group of professional singers who will croon, swoon and charm their hearts out to give you a classy and sensational performance! What exactly will a Rat Pack Tribute Act do at your event? Hire a Rat Pack Tribute Act and you will not be disappointed! A Rat Pack Tribute Act will not only sing amazing renditions of all the best songs of the Rat Pack era, but they will dress up in Rat Pack suits and hats and they will also stay in character as the Rat Pack members through out the entire show! The Rat Pack was a group of multi-talented men who practically owned Hollywood through the late fifties and 60s! To be in the Rat Pack, you had to be a smooth, swathe and sophisticated singer and actor, who oozed self confidence and charisma! The Rat Pack era marked a golden era in entertainment which produced classic Rat Pack members such as Frank Sinatra, Dean Martin and Sammy Davis Jr. When you hire a Rat Pack Tribute Act, you will get a solo singer or a group of singers who will pay tribute to these wonderful stars of the 1950s and 1960s and will sing classic Rat Pack songs that may include: ‘My Way’, 'Come fly With Me’, and ‘Under My Skin' by Frank Sinatra. ’Sway’, ‘Ain’t That a Kick in the Head’ and ‘Everybody Loves Somebody’ by Dean Martin, and ‘The Candy Man’, ‘I’ve Gotta Be Me’ and ‘Mr Bojangles’ by Sammy Davis Jr! Mainly, a Rat Pack Tribute Act will entertain your audience with a fantastic live show that will put the wow factor into celebrations and impress your guests, whatever their entertainment tastes may be. What event types are Rat Pack Tribute Acts hired for? If, like many others, you are mad about Frankie, Sammy and Dino, then you may want to hire a Rat Pack Tribute Act to dazzle at your wedding ceremony! The live singer, or singers, can perform a feel-good Rat Pack hit as the wedding guests are entering the wedding venue, such as ’Theme From New York New York’ by Frank Sinatra! The Rat Pack Act can then play an easy-listening romantic hit as the bride is walking down the aisle. There are many love songs from the Rat Pack singers to choose from, but we would suggest the glorious ’Strangers in the Night’ by Frank Sinatra or ‘Everybody Loves Somebody’ by Dean Martin. The Rat Pack’s long lasting music was made for occasions such as wedding drinks receptions! The Rat Pack Covers Act can sing over backing tracks or simply have a live acoustic guitarist or keyboardist as backing music. They will be able to sing inside or outside (weather permitting!) and they will provide the best in big band/easy listening music as the wedding guests are sipping on champagne! If you want to provide your guests with a chilled out and relaxed form of live music entertainment at your wedding breakfast, then hire a Rat-Pack Tribute Act! Sammy, Frank and Dean definitely knew how to project a cool yet excitable atmosphere wherever they went and the Rat Pack impersonators will do their best to capture the glory days of the 50s and 60s! How about a bit of ‘That’s Amore’ by Dean Martin being sung live by a Dean Martin Tribute Act as the wedding cake is being cut?! If you want a live music show for your wedding evening reception that Las Vegas would be jealous of, then we strongly advise to hire a Rat Pack Tribute Act! The Rat Pack Tribute Act will capture the on-stage camaraderie and chemistry that the Rat Pack were famous for! 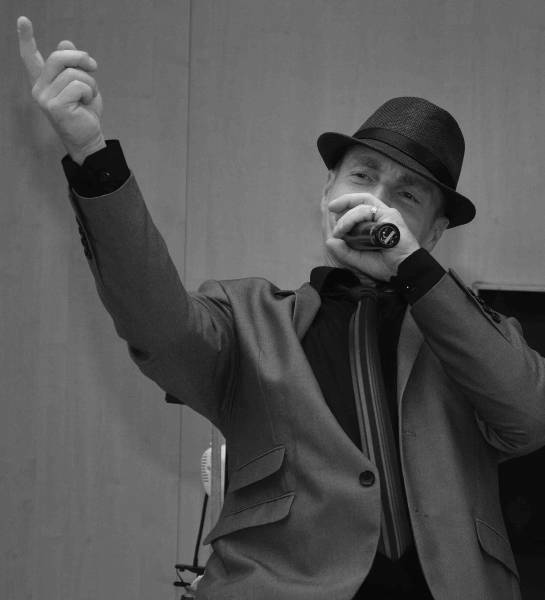 The Rat Pack Tribute will tell stories, anecdotes and make everybody feel welcomed and relaxed at your wedding evening reception entertainment! Book a Rat Pack Tribute Act for your corporate entertainment and you will get a professional act who will have a talent for impersonating all the Rat Pack greats! The Rat Pack Tribute Act will consider songs from Humphrey Bogart, Peter Lawford, and Bing Crosby, but will mainly focus their attentions on Frank Sinatra, Dean Martin and Sammy Davis Jr!. They will play all of the hits that your colleagues will know and love, helping everyone to bond at an annual work party! 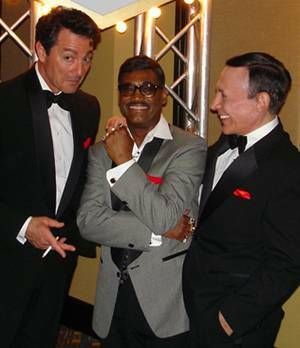 You may want to hire a Rat Pack Tribute Act for your trade show or your product launch? The ‘Summit’ or the ‘Clan’ as the Rat Pack were also known as, will blow you away with a professional show that will undoubtedly draw-in large crowds! Rat Pack impersonators will also be fantastic as cruise ship entertainment or as holiday camp singers! If you’re looking for a theme for your annual party, then look no further than a Rat Pack themed party! 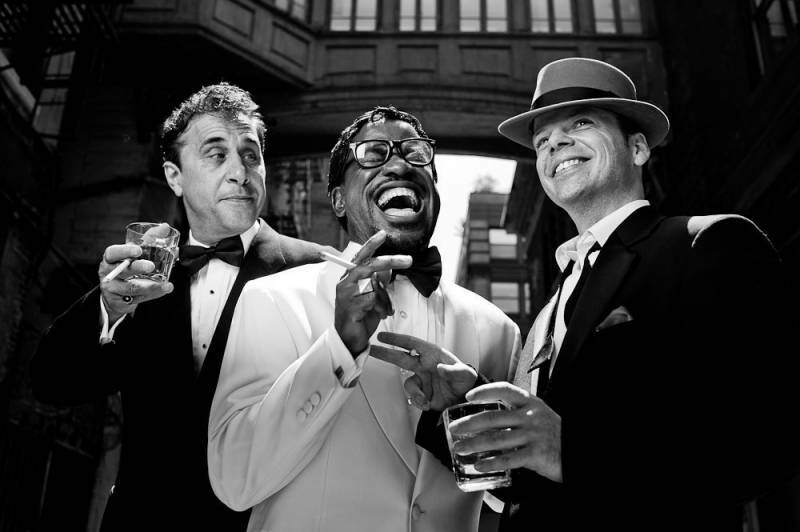 A live Rat Pack Tribute Act will be the icing on the cake! The timeless cool of Sinatra and co will bring a real nostalgic yet effortless atmosphere to your party! You and your friends can dress up as the cast of the original Oceans 11' film or simply wear 50 era suits, ties, hats and glamorous 50s dresses! How much do Rat Pack Tribute Acts cost to hire? Our simple to use entertainment directory allows you to firstly search for the best Rat Pack Tribute Acts who are local (or travel to your area) and then via the contact form you may message them directly to enquire for a no obligation quote to perform at your event. Some acts will also add a rough price guide to their profile for your convenience. What are the usual set formats and performance lengths for Rat Pack Tribute Acts? A Rat Pack Tribute Act can tailor their performance times to suit you and your event, however, on average a professional Rat Pack Tribute Act will perform for two 45 minutes sets. How much space will a Rat Pack Tribute Act need at your event? This will depend on how many members the Rat Pack Tribute Act has. The act may consist of one person, singing all of the Rat Pack hits alone, or it may consist of three singers plus a backing band. We would advise to contact the act personally using our messaging service to enquire. What equipment and set up requirements do Rat Pack Tribute Acts need? As with most artists who sign up to Entertainersworldwide.com, a Rat Pack Tribute Act will provide all of their own equipment. You may want to enquire if an artist needs a PA to amplify their sound, in which case we would advise to use our easy to use messaging service to find out. We do ask that each performer gets a backstage area in which they can prepare for the performance ahead. If your venue does not have a backstage area, then we kindly ask that you enquire with the venue to seek an alternative space in which the performer can comfortably get ready to entertain. How can you find and book a Rat Pack Tribute Act with Entertainersworldwide.com? WANT TO RECEIVE A RANGE OF QUOTES FROM Rat Pack Tribute Acts?